Gold Sluice Box Plans – What to Consider? Gold sluice box is a basic type of gold prospecting equipment that has been used by gold miners for over a hundred years. The first prototype of a gold sluice box was created all the way back in the Gold Rush time period of America around 1849 from wood planks that were plentiful on mining sites. Old time sluice boxes were very heavy and cumbersome to move around but were still preferred over gold panning dishes that required strenuous manual labor to operate. Nowadays gold sluice boxes are constructed from lightweight materials like aluminum and steel. The bottom of the sluice box is lined with detachable riffles that allow heavy riverbed material to be trapped in between. To operate a gold sluice box one needs to learn a few basic principles and understand how this type of gold mining equipment works. The main idea behind operating a gold sluice box is putting the force of the river stream to work for you; therefore, it is important to work in areas with flowing water streams. Riverbed masses like gravel, sand and rocks are gradually loaded into the sluice box and placed into the water at a certain angle. It might be initially difficult to gauge which exact angle to use but with a few tries, you will start understanding this concept. It’s very important to not overload the gold sluice box, so the system can work efficiently. At this point you can manually remove especially large rocks to allow river stream to start separating riverbed masses. Naturally heavier deposits like gold and black sand will sink to the bottom of the riffles. Larger natural gold nuggets could be visible almost right away on black rubber mats that line the riffles. 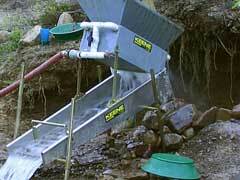 Take care to examine the bottom portion of the sluice box to clear any waste rock jams. By the time you see mostly black sand, it’s time to remove your sluice box from the water and perform cleaning. Make sure to carefully rinse the black matting since gold sand may get underneath it. Rinse the remainder of the gravel through a concentrate bucket to get each and every piece of gold deposits.